Peter (or Patrick) McLagan [1774−1860] was the nephew of the merchant and plantation owner James McInroy, his mother being James’s sister, Grace McInroy. He was in Demerara by 1807 (E&DRG 3 Jan 1807), probably working for his uncle’s firm. He retired from Sandbach, Tinne & Co in 1821 but remained in Demerara until at leat 1825 (The Demerara & Essequebo Vade-Mecum, 1825). In 1834 McLagan and Samuel Sandbach received compensation of over £21,000 [LBS BG2512]. He acquired the estate of Pumpherstone, near Mid-Caldar. In Edinburgh in 1827 he married Elizabeth Hagart Stewart [1794−1833]. No children were born of this marriage but he already had two children from a relationship in Demerara: John, his oldest son, who became a surgeon and died in Demerara in 1850; and Peter [1823−1900]. John graduted from Edinburgh University in 1836 and in 1841 was resident with the manager at Vive la Force plantation, Demerara, from where he reported favourably on the health of 'coolie' labourers [House of Commons Papers, Volume 16]. 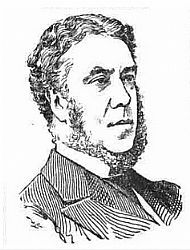 The younger Peter McLagan was educated at Tillycoutry school and Edinburgh University (Dod's Parliamentary Companion), inherited Pumpherstone, and was the Member of Parliament for Linlithgowshire from 1865 until 1893. He invested in the production of shale oil but was declared bankrupt in 1893. See biography of Peter McLagan MP at Scottish Shale.